Here is the latest: The storm has now began to form over the southern Gulf Coast. It looks to take a track through the Ohio River Valley and lower Michigan, dumping moderate snow on the back side of the system. Unfortunately, models and National Weather Service offices for that matter, are having a tough time forecasting the exact track and impacts. One question is whether or not thunderstorms will take away from available moisture in the cold sector of the system. 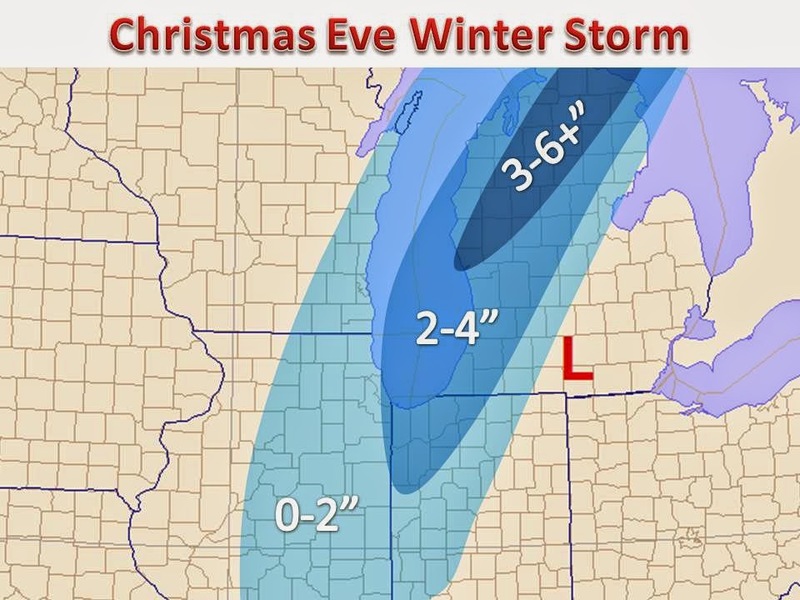 Below is our best forecast for the area of snow Christmas Eve. Winter weather advisories and winter storm watches have been posted in Illinois and Lower Michigan. This is a highly irregular storm system, the origin of development and fact that the Midwest is still waiting for another storm to clear, has created problems in the numerical models. We will make tweaks as needed to the forecast.